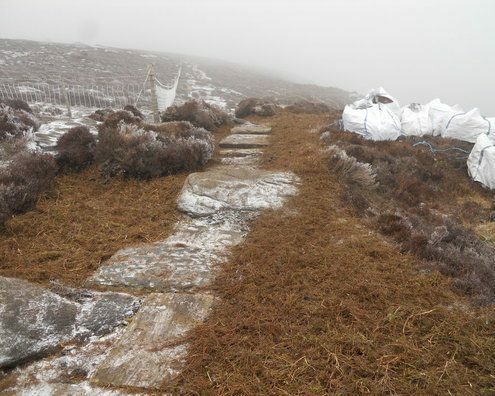 Conservefor Ltd was appointed by ‘Moors for the Future’ to undertaken essential restoration work on a severely eroded section of footpath above Edale known as Ringing Roger. Due to the nature of the site all materials were airlifted and dropped near the footpath. The site was very steep and rocky making access onto the work area and construction of the path very difficult. The project brief included marshalling the helicopter drop of materials, defining a suitable route across the eroded scree-covered slope, stone pitching, construction of stone water bars, flag laying and landscaping. Our recreation team walked to site daily, once onsite after undertaking site specific risk assessment and a tools box talk they emptied the dumpy bags and started constructing the pitched path. The team worked in pairs constructing between 8 – 10 metres per day. Each night the site was left safe and secure. Detailed landscaping work was essential to ensure that the new path fitted with the surrounding upland habitat. Our team used excavated materials and unsuitable path building material to strategically block any desire lines keeping walkers on the newly pitched path. Excavated soil was forced between the joints in the pitched path surface to encourage colonisation by native grasses helping the new path to blend in. The flagged section of path over a deep area of peat was laid by a team of four staff ensuring manual handling guidelines were followed. Metal bars, picks and timber rollers where used to manoeuvre the flags into position. Once levelled and butted together the remaining bare peat adjacent to the track was protected using double chopped heather brash.